After one year, nine months and 18 days, the mechanical lift bridge in Rio Hondo was closed again Tuesday morning. But after a brief wait to apparently test the lift part of the bridge, it re-opened and traffic was once again on its way over the Arroyo Colorado. 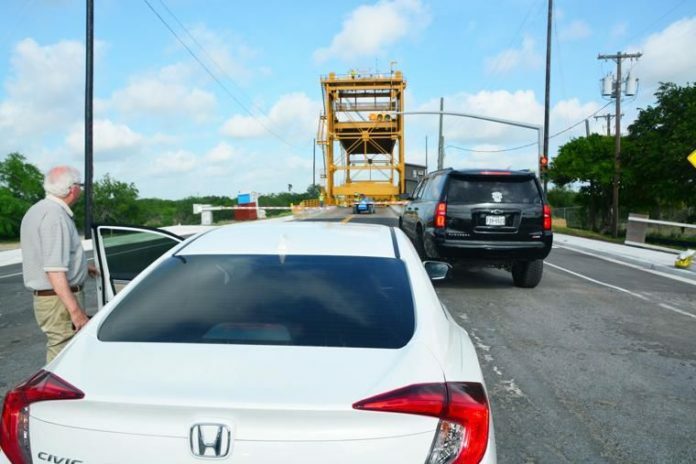 RIO HONDO — After one year, nine months and 18 days, the iconic yellow Rio Hondo mechanical lift bridge re-opened for vehicular business at 4 p.m. Friday. Then yesterday morning at 9:30, it shut down. Flashers were flashing, traffic was backing up, and confused motorists put cars and trucks in park as they watched the lift portion of the span across the Arroyo Colorado lurching upward. Rio Hondo residents might have suffered flashbacks from the 20 months their city was cut in half, but 10 minutes later the test was finished, and the crew from PCL Civil Contractors Inc. appeared satisfied. Hartzog’s grocery store is an important fixture not just here in Rio Hondo, but for Arroyo City and all points east. But keeping things together over the past 20 months hasn’t been easy. Hartzog, a Rio Hondo native, said he believes most businesses in Rio Hondo are down about 20 percent due to the $12.4 million rehabilitation work on the unique mechanical lift bridge that opened to traffic in 1953. It needs to be a working structure to allow barge traffic upstream to the Port of Harlingen. Many businesses hunkered down and reduced inventory of some products, and Hartzog said those businesses now will move to replenish those stores as profits pick up. During the time the bridge was down, the official detour to the east side of Rio Hondo was via San Benito. But many motorists or boaters heading to the coast bypassed Rio Hondo, choosing alternative routes to their destination. Evidence of Rio Hondo’s tough retail climate could be seen for the past 18 months as the city’s monthly sales tax allocations declined. The State Comptroller’s Office releases the data each month and it roughly corresponds with the health of a municipality’s retail sector. After the bridge closed in late September 2016, monthly sales tax allocations were still positive, with Rio Hondo posting a 5.50 percent gain in December over the same month the previous year, and a 4.12 percent gain in January. But then the bottoming out began, with sales tax allocations down nearly 20 percent in February and March, and 9 percent in April. This was the beginning of a string of down months which only recently have begun to show some easing. Patti McMillen is park manager at Twin Palms RV Resort right in downtown Rio Hondo. Her business, she said, wasn’t impacted as much by the bridge closure as others because the RV park itself depends pretty much on its reservation system and thus is not dependent on luring in traffic transiting the town. “We’re a destination spot so people plan months ahead of time to come here,” she said. “It inconvenienced them, and definitely lot of people had to go around it. TxDOT’s original estimate of the time until project completion — 18 to 24 months — was spot-on. But at various points in the bridge rehabilitation process, some TxDOT engineers spread the word the project was ahead of schedule. The city came up with $50,000 and received a $350,000 TxDOT grant to install new sidewalks and landscaping in the city’s downtown area. Other less visible improvements are new water meters and a project to rehabilitate the city’s water plant. The city also has picked up some property in the downtown area, and hopes to parlay them into some type of economic development project.